288 pages | 70 B/W Illus. 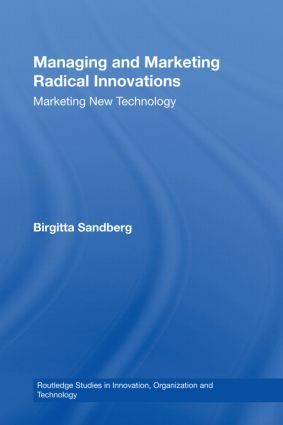 This book responds to a growing demand in the academic community for a focus on customer-related proactive behaviour in the study of radical innovation development, combining a thorough theoretical discussion with detailed international case studies considering the role of this proactivity in five firms engaged in the process. Unlike other studies in this area, this book demonstrates that anticipation plays an important role at the idea generation stage and Sandberg introduces a new way of describing a firm’s proactivity as a dynamic pattern. Furthermore, the deeper consideration of customer related proactivity contributes to the study of market orientation, which increasingly focuses on the proactive side. Birgitta Sandberg is Assistant Professor in International Business and coordinator of the Global Innovation Management Masters Degree Programme at the Turku School of Economics, Finland.